The subtle aroma of the essential oils cream captivates swing of moods, feelings and emotions. The draining properties of the essential oils of Turmeric, Ginger and Cinnamon, stimulate the whole being and helps relax the body muscles. Extracts of Brown and Red algae mineralizes, increases microcirculation and eliminates toxins leaving the skin soft and supple with heightened moisture level. The first casualties of stressful life is the shoulder and back resulting in pain and tension , our expert therapist dissolve the tension stored in the muscles of the back and leave you feeling energised and refreshed using specialised soothing blend of aroma oil. We distribute these "amenities" directly to quality resorts & spa, hotels and hospital establishments for the comfort and convenience of their guests. We also serve the distributor market through established and carefully managed associations with co-packers and recognized supply-chain entities. Aromatherapy is a holistic treatment based on the external use of essential aromatic plant oils to maintain and promote physical, physiological, and spiritual wellbeing. The essential oils may be used in massage, added to a warm bath, used to moisten a compress that is applied to the affected part of the body, added to a vaporizer for inhalation or diffused throughout the room. Balance, detoxify, and fortify the mind and body with a customized aromatherapy massage. This therapeutic treatment will address various symptoms associated with everyday stress while enhancing your current state of well-being. Unwind yourself with a full body massage using rich blended essential oils. The aroma oils relaxes the senses directly, gives you the experience of deep meditation along-with a healing touch. Don’t forget to select a aroma blend of your choice. 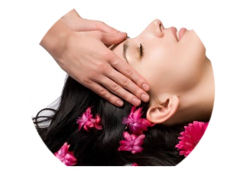 This wonderful massage helps to relieve tension and headaches relaxing taut and aching muscles and banishing insomnia. It is a massage usually done by using a romantic essential oil made of plants and herbs. It’s a full body massage for relaxatation. Adding heat to our aromatherapy range gives this massage its signature footprint. Enjoy the dexterity of our therapists while they employ the warmth of your chosen essential oil blend. It's a perfect way to relieve stress, improve circulation and detoxify the body.